How can fintech solutions assist with a financial institution's AML strategies? What needs to be considered when evaluating AML fintech solutions? How will the AML function change with the introduction of new technologies? These questions and more will be addressed by AML industry professionals who will bring their unique perspectives and experiences to the AML + Fintech panel discussion. 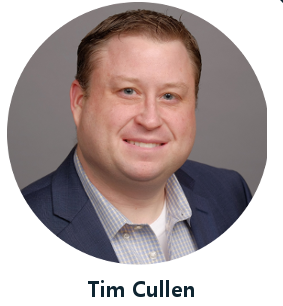 Tim Cullen is the Chief AML Officer of INTL FCStone. At INTL FCStone, he is the Managing Director of AML, which encompasses the enterprise-wide Anti-Money Laundering, Surveillance, OFAC/Sanctions, Due Diligence Investigations and AML Advisory programs of the Firm. ​Prior to joining the firm in 2015 he was with TD Ameritrade as Head of Surveillance encompassing Anti-Money Laundering, Trade-based and Associate Surveillance. Before working at TD Ameritrade, he served as the Chief AML Compliance Officer at thinkorswim, Inc. where he created and managed the Firm's Global AML and Fraud Departments. Tim previously served as a Compliance Examiner for FINRA. Dr. Henry Balani is currently Principal at Blockchain Advisory Institute, where he advises companies on how to drive innovation by using the Blockchain. Dr. Balani is a noted industry commentator on issues leveraging the Blockchain, Digital Assets and Regulatory Compliance. As a published academic, Dr. Balani also teaches international business, economics and regulatory compliance courses globally. At Accuity, a division of the RELX Group (formerly Reed Elsevier) he was responsible for driving Blockchain partnerships and thought leadership in the financial services industry. He developed relations with major Blockchain technology firms including R3, Ripple & IBM. In his prior role as Head of Innovation, he helped pioneer new AML sanction screening solutions related for trade compliance. Dr. Balani also had oversight for Accuity’s Compliance Group that included Product Management and Professional Services related to all Compliance solutions. Accuity is a global provider of payments and compliance solutions with clients in the Financial Services and Corporate sectors, including banks, money services businesses, insurance, shipping, and manufacturing firms. Prior to joining Accuity, Dr. Balani was managing consulting practices with some of the largest professional services organizations in the world, including Accenture and IBM. Dr. Balani was also at Pegasystems as their Consulting Director in their Financial Services practice. At IBM, he was their Director of Client Services in the Software Group where he successfully managed Lotus' delivery capability in Web application development engagements for financial institutions. He was also a Consulting Manager at Andersen Consulting, now Accenture. Mr. Balani’s career began with PriceWaterhouse Coopers in their Advisory Consulting practice. Dr. Balani holds a Doctorate in Business Administration from the University of Wisconsin-Whitewater, an M.B.A. from Northern Illinois University and B.S. in Economics, International Trade and Development from the London School of Economics. He has also held certifications as a Certified Anti-Money Laundering Specialist (CAMS) from the Association of Certified Anti-Money Laundering Specialist (ACAMS) and a Project Management Professional (PMP) from the Project Management Institute. 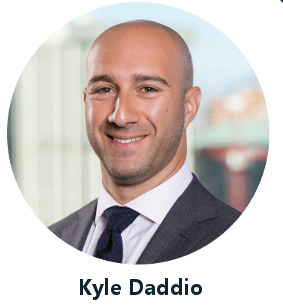 Kyle Daddio is currently the Chief AML Officer at Interactive Brokers LLC., where he is responsible for overseeing the firm’s AML, KYC, Sanctions, and Trade Surveillance programs. Prior to his current role, Mr. Daddio was Vice President with Promontory Financial Group, leading the Global Quality Assurance function for the AML and Regulatory Compliance managed services practice. Prior to Promontory, Mr. Daddio was a Senior Consultant in Crowe LLP’s Risk Practice, where he specialized in Anti-Money Laundering, Regulatory Compliance, and Fraud Investigations. Mr. Daddio began his career with the Federal Bureau of Investigation, working in the Counter-Terrorism Division and on the National Joint Cyber Investigative Task Force. He also represented the FBI overseas as part of the US Joint Special Operations Command and in Guantanamo Bay as a member of the FBI’s High Value Detainee Prosecution Task Force. Mr. Daddio holds a Bachelor’s in Economics and MBA from Mount St. Mary’s University. 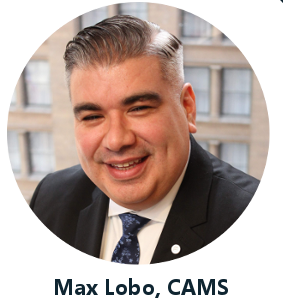 Max Lobo is an experienced AML/BSA Risk Compliance professional and a Certified Anti-Money Laundering Specialist (CAMS) with sixteen years of global financial services experience in all aspects of banking and brokerage services in multiple lines of business. He has a background in Sales, Treasury and Payment Solutions, Corporate Security, AML Investigations, Audit Validations, Risk Compliance Consulting, AML Alert System Tuning, and AML Operations Development. Mr. Lobo is currently a Vice President and Senior Manager of Bank of Montreal’s (BMO) Treasury Payment Solutions (TPS) Risk and Compliance team. In this role, Max is responsible for overseeing the North American compliance programs for the bank’s payment product group with a focus on AML and emerging risk. Prior to his current role, Mr. Lobo was the US AML Risk Officer for the Personal and Commercial line of business at BMO. During his tenure in this role Max developed and executed strategies to build and remediate the BSA/AML and OFAC compliance program. Prior to joining BMO, Max was a Senior Consultant in Crowe LLP’s Risk Practice, where he specialized in Anti-Money Laundering, and Regulatory Compliance. Max worked assisting bank’s that were subject to strict regulatory time lines in remediating their AML programs. Prior to joining Crowe, Max was an AML Senior Analyst with TD Ameritrade and he conducted complex AML investigations focusing on market manipulation. Mr. Lobo began his financial services career with Bank of America as a banker and then joined the Corporate Security Investigative team where he conducted complex due diligence investigations. Max also worked in the AML Investigative team within Bank of America prior to joining TD Ameritrade. ​Mr. Lobo holds a B.A. in Political Science from the University of Iowa, and a Paralegal certification from Loyola University Chicago, Institute for Paralegal Studies where he focused on Criminal law and Legal Research. Max also attended the American Military University where he specialized in Intelligence Operations and Terrorism studies.